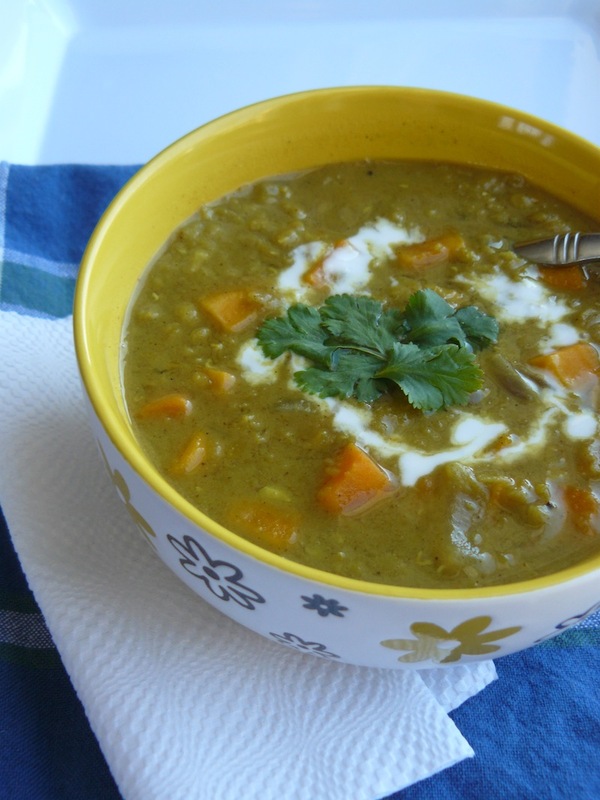 Super Curried Red Lentil and Sweet Potato Soup – Ashleigh Grange, R.H.N. While we wait for spring to make its official appearance, let’s celebrate with one of my favourite fall/late winter soups. My Super Curried Red Lentil and Sweet Potato Soup made its debut at my fall-inspired Everyday Superfoods cooking workshop last November and instantly gained a throng of fans. Well, at least one or two of them. Normally this recipe sells as part of my Everyday Superfoods recipe pack, but today it’s all yours just for visiting and for celebrating the departure of winter/arrival of spring with me! 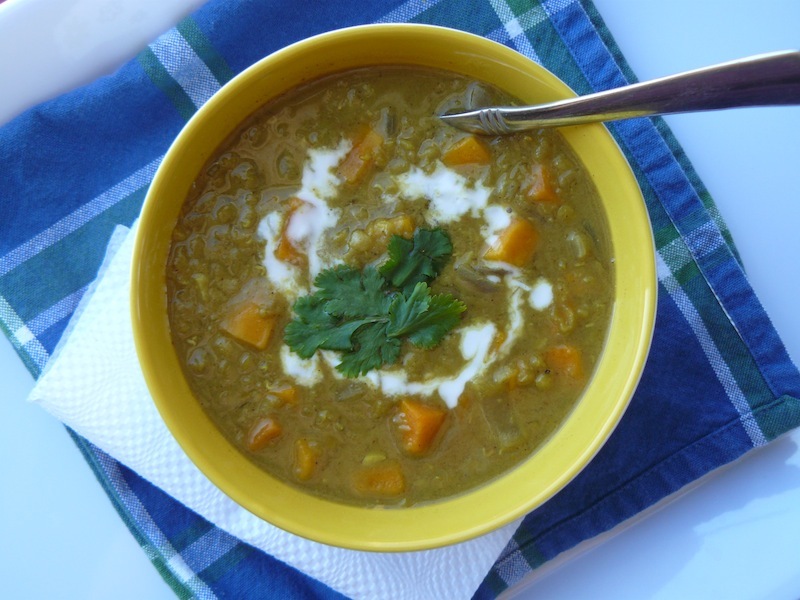 My Super Curried Red Lentil and Sweet Potato Soup makes for a lightning-fast lunch or supper and is equal parts warming and spicy. Best of all, if you have red lentils and sweet potatoes in your kitchen, you can make this without a trip to the grocery store. The spices are interchangeable so don’t feel like you have to stick rigidly to them. Like with all of my recipes, don’t hesitate to make this soup your way, according to your rules. Gaining culinary confidence is all about trying new things depending on what you feel like at any given time. In a large saucepot, sweat the onion over low-medium heat with a tablespoon of coconut oil for 3-4 minutes or until the onion is soft and translucent. Add garlic cloves, sweet potatoes, red lentils and water. Cover and bring to a boil. Reduce the heat to a simmer and cook for 15 minutes. Add spices and salt and stir well. Remove from the heat. Stir in the coconut milk. Adjust seasoning if necessary. Serve with a dollop of coconut milk on top. Enjoy. In the meantime, what’s your favourite kind of soup? Who makes it? Life is a plate… Eat up! Your info is safe with me. I will guard it with my life and promise no spam, ever. I genuinely hate it as much as you do! Would your friends like this? Share it! This entry was posted in Lunch & Dinner, Recipes, Soups & Stews and tagged allspice, cayenne, chile, coconut milk, coriander, cumin, dairy-free, egg-free, fall, ginger, gluten-free, nut-free, red lentils, soup, soy-free, sweet potatoes, turmeric, vegan friendly, winter. A Culinary Nutritionist and Registered Holistic Nutritionist (RHN), I'm a voracious reader who loves to develop new recipes, read and write about health and wellness, and jump on my trampoline! You can read more about me on my About page. A Registered Holistic Nutritionist (R.H.N. ), workplace wellness instructor and private chef, I'm passionate about local, seasonal eating and I believe that what we feed our bodies (and our minds!) profoundly affects our health at every level. Here I share stories, recipes, nutritional and health info, and helpful tips and techniques to boost your kitchen confidence and health consciousness. Discover my favourite products & services! Nothing on this site should be interpreted or construed to mean providing medical advice, diagnosis or treatment in any way. Always see your primary care physician for that, and always consult them before embarking on any new health program, starting or changing any of your medications, or using natural products of any kind. All content, recipes and photographs are © Ashleigh Grange, R.H.N. 2013-2019. All rights reserved.